Heart Internet was established in 2004 by Tim Beresford and Jonathan Brealey. The company is based in Nottingham in the United Kingdom and is a leading provider of shared and reseller hosting. In 2011, the company was acquired by Host Europe Group and is among the five biggest web hosting providers in the UK. Customer service plays an important role in the success of a web hosting company. Heart Internet is no stranger to this principle and has developed a comprehensive customer support system to address clients’ concerns. The company provides a feedback form on the cPanel offered to clients. Clients can use the feedback form to convey suggestions and queries to the support staff. The support staff are based in the UK and are available 24/7 to help clients. The company has a customer support email address and a toll-free number. There is a live chat service but it is limited to accepting sales orders. The website features a Support page where articles are uploaded regularly to educate clients about technical issues. Heart Internet maintains top-of-the-line data centers in the United Kingdom. The company uses IBM servers built with Cisco technology which help it to deliver high quality performance to clients. Heart Internet has invested in a widespread network that enables it to maintain large bandwidth capacity. All the data centers are equipped with round the clock security for hardware and software. CCTV offers surveillance within the data center as well as outside. Physical security restricts access to only authorized personnel and a firewall offers protection against hackers. The servers are maintained within temperature and humidity controlled facilities. Protection against fire and other disasters is also provided. The servers are supported by two separate power lines which ensure uninterrupted service. UPS and diesel generators increase the company’s power generation capacities. The company maintains an in-house customer service team comprising of competent and responsive professionals. The systems maintained by the company are equipped with a high degree of automation to offer greater convenience and flexibility to the user. The hosting plans give the clients a great degree of autonomy and control over managing server resources and network performance. The prices at which the company offers its hosting plans are competitive in the industry and are largely affordable by the clients. Heart Internet offers shared and reseller hosting plans to individual and corporate clients. 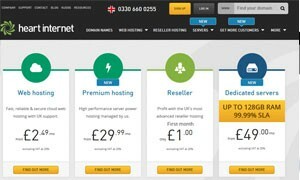 Shared hosting plans include Starter Pro (starting from £2.49 per month), Home Pro (starting from £7.49 per month) and Business Pro (starting from £10.83 per month). Premium hosting plans include Base (starting from £29.99 per month), Plus (starting from £49.99 per month) and Pro (starting from £119.99 per month). Reseller hosting under the Reseller Pro program starts at £29.99 per month). Heart Internet offers a guarantee of 99.99% uptime on server performance. The company claims to have accommodated a high degree of redundancy in terms of network components and connections which enables it to minimize downtime to the lowest possible level. Moreover, the company claims that any network problems and glitches will be repaired in no longer than four hours. If the company fails to do this the clients are entitled to claim a day’s service for each additional hour beyond the four-hour period. Since the customer support representatives are technical professionals, their responses might come across as too technical or sophisticated for the ordinary user. The website is not very informative and often the hyperlinks are not directed to the correct page. There might be problems with server speeds especially for reseller hosting plans. Heart Internet offers amazing discounts on service plans through various coupon codes on shared, reseller and premium hosting plans. The discounts range from 10% to 50% of the rates. In 2015, it won the ISPA Award for best shared hosting. In 2014, Heart Internet received the Editor’s Choice Award by Micromart. The company won the PC Pro Best Web Host Award three years in a row in 2013, 2014, and 2015. In 2013, Host Review awarded Heart Internet with the Best Reseller hosting provider of the year. In 2009, the company was acknowledged as one of the 50 fastest growing companies in the UK and the fastest growing Internet company by Deloitte Technology. On Google Plus at https://plus.google.com/+heartinternet. Although I found the prices a bit intimidating, I think the service is well worth it. These guys know their business and understand what a client needs. I have been using Heart Internet’s re-seller plan for the past 3 years and have never experienced a problem with service quality. The support staff are friendly and were particularly patient with me since I was not a technical expert and needed a lot of guidance. I strongly recommend their shared hosting services for new online business owners.